Details about Like N E W Sennheiser e602 II Dynamic Bass Kick Drum Mic Opened Box Never Used! Like N E W Sennheiser e602 II Dynamic Bass Kick Drum Mic Opened Box Never Used! Did a lot of research and decided on this for my kick drum as compared to a d112,beta52,and d6.I chose this primarily because it liked being up close to the head ,and does a nice job there. My only complaint is the microphone holder .I'd like to see the microphone base and holder have serrations of some type cause you have to tighten it very tight for internal kick drum mounting, so the microphone doesn't drop during play. Over all, I love it. This mic is awesome. I have it a couple inches front the batter head on my kick. It produces a deep punch and no garbage with it. I have a dedicated speaker and mixer I run it from. If you looking to mic up this your kit in a professional way buy this. Don't go cheap you wont get the sound. I've been there. I also have the 604 mics for my Tom's and equally love those. So far I’ve used the mic on my kick drum and it has a very balanced, non-hyped sound with great low end. I’m sure it would sound amazing on floor toms as well. I've used this microphone in a hand drum called "tan-tan". It is a Brazilian drum and produce a nice low and clear sound without that undesired humming. It is very solid and well made microphone. I would recommend this mic to anybody and I would buy it again. You can not go wrong with Sennheiser microphones. 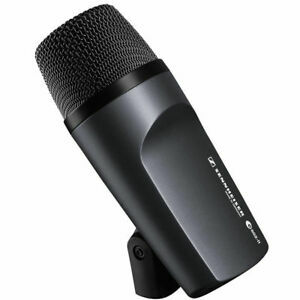 Good Microphone, nice deep sound,easy to use it.Good price.I'm looking for something like this one. Thanks a lot.